Crystal Palace boosted their top-flight survival hopes with victory over fellow strugglers Norwich, recording their first Premier League win of 2016. 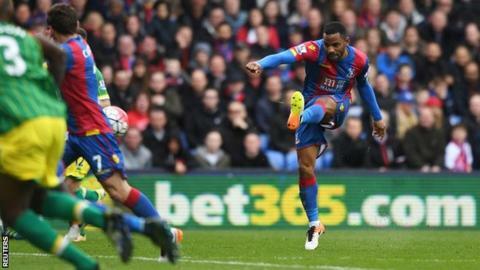 Jason Puncheon scored his first goal of the season, cutting in from the left to score from 20 yards and lift Palace 10 points above the relegation zone. Norwich will point to a penalty appeal when Matt Jarvis was barged over, but they had few clear-cut chances. They lie four points above 18th-placed Sunderland, who have two games in hand. The Canaries claimed a late win over Newcastle last weekend but, with 16th-placed Palace increasing the gap between the teams to six points, Norwich's home game against Sunderland next Saturday could prove crucial. After Aston Villa neared relegation and Newcastle's defeat at Southampton, Palace now have a sizeable gap and another point should be enough to ensure survival. Having missed what he described as a "sitter" in the first half when he sliced a chance wide from 12 yards, Puncheon appeared to be in tears after his game-winning goal which meant Palace became the final team from England's top four divisions to win a league game this year. He was later withdrawn as Palace hung on, but a first goal since May 2015 earned a first Palace win since 19 December, a time when they appeared to be pushing for a European place. Their barren run since has included six straight home defeats but having earned a point at West Ham last weekend, there were signs that Alan Pardew's side were beginning to turn their form around. The returning Dwight Gayle and Yohan Cabaye added pace and poise to Palace's play, but despite a succession of crosses, the hosts could not find a killer blow. That changed when Puncheon scored a goal all of his own making to send waves of relief around Selhurst Park at the final whistle. It also means that they could secured their Premier League safety before the FA Cup semi-final against Watford on 24 April, although they face Everton, Arsenal and Manchester United before then. Norwich were the form team coming into this game, buoyed by two wins and a draw in their last three games, including their injury-time triumph against Newcastle. In an edgy first half, they were on equal footing with the hosts as neither side threatened a breakthrough. Palace keeper Wayne Hennessey had some nervous moments but the biggest talking point came when Norwich's Jarvis appeared to be barged over by Damien Delaney. However, referee Michael Oliver waved away the visitors' appeals. The Canaries did increase their intensity once Palace went ahead and Ryan Bennett, who was solid in defence, had a volley well saved by Hennessey. But Palace stood firm in the face of late pressure, despite Norwich keeper John Ruddy joining the attack from set-pieces. Crystal Palace boss Alan Pardew: "I was as nervous today as I have ever been in football. Sometimes the media can keep drilling it into you and in the end you are carrying that burden. I wanted to calm them down at half-time and they delivered for me. "It was a robust challenge from Damien Delaney, to say the least. We had the best referee in the Premier League and he didn't say it was a penalty so I'll go with that. "We are four points from mid-table and that is where we should be. If we can finish as high as we can then we can still get 11th. That's what we want to hunt down." Norwich manager Alex Neil: "It was down to fine margins - there wasn't much in the game. You could see what was at stake for both sides and there weren't many clear cut chances for either side. "I wouldn't put [the performance] down to nerves, it was just that nobody wants to make a mistake. You are just hoping to make the breakthrough first." Jason Puncheon ended a run of 26 Premier League games without scoring. Norwich have kept just one clean sheet in 17 away games this season in the Premier League. Norwich are winless in 15 away league games against Crystal Palace, last winning away to them in May 1996 (D5 L10). Crystal Palace kept their first clean sheet in the league since December, ending a run of 12 games without one. Palace can put further distance between themselves and the relegation zone when they face Everton at home in their game in hand. Norwich face a hugely significant contest against fellow strugglers Sunderland at home next Saturday. Match ends, Crystal Palace 1, Norwich City 0. Second Half ends, Crystal Palace 1, Norwich City 0. Foul by Patrick Bamford (Norwich City). Attempt missed. Robbie Brady (Norwich City) left footed shot from outside the box is too high. Assisted by Ryan Bennett. Corner, Norwich City. Conceded by Pape Souaré. Attempt missed. Nathan Redmond (Norwich City) left footed shot from outside the box misses to the right. Assisted by Andre Wisdom. Attempt missed. Mile Jedinak (Crystal Palace) header from the centre of the box misses to the right. Assisted by Yohan Cabaye with a cross following a corner. Attempt saved. Robbie Brady (Norwich City) right footed shot from the centre of the box is saved in the centre of the goal. Assisted by Dieumerci Mbokani with a headed pass. Attempt blocked. Yohan Cabaye (Crystal Palace) right footed shot from a difficult angle on the left is blocked. Attempt missed. Damien Delaney (Crystal Palace) header from the centre of the box is close, but misses to the left. Assisted by Yohan Cabaye with a cross following a corner. Corner, Crystal Palace. Conceded by Sebastien Bassong. Attempt blocked. Yannick Bolasie (Crystal Palace) right footed shot from the left side of the six yard box is blocked. Assisted by Damien Delaney. Attempt missed. Damien Delaney (Crystal Palace) header from the centre of the box misses to the left. Assisted by Yohan Cabaye with a cross following a corner. Substitution, Crystal Palace. Connor Wickham replaces Dwight Gayle. Corner, Crystal Palace. Conceded by John Ruddy. Attempt saved. Wilfried Zaha (Crystal Palace) right footed shot from the right side of the box is saved in the top centre of the goal. Assisted by Yohan Cabaye. Gary O'Neil (Norwich City) wins a free kick in the defensive half. Substitution, Crystal Palace. Joe Ledley replaces Jason Puncheon because of an injury. Attempt saved. Martin Olsson (Norwich City) header from the centre of the box is saved in the bottom left corner. Attempt saved. Wilfried Zaha (Crystal Palace) left footed shot from outside the box is saved in the bottom right corner. Assisted by Yohan Cabaye. Attempt blocked. Robbie Brady (Norwich City) right footed shot from the centre of the box is blocked. Assisted by Jonny Howson. Attempt saved. Yohan Cabaye (Crystal Palace) right footed shot from outside the box is saved in the bottom right corner. Assisted by Jason Puncheon. Attempt saved. Ryan Bennett (Norwich City) right footed shot from the centre of the box is saved in the bottom left corner. Assisted by Gary O'Neil. Mile Jedinak (Crystal Palace) is shown the yellow card for a bad foul. Patrick Bamford (Norwich City) wins a free kick in the attacking half. Goal! Crystal Palace 1, Norwich City 0. Jason Puncheon (Crystal Palace) left footed shot from outside the box to the bottom left corner. Assisted by Joel Ward. Substitution, Norwich City. Patrick Bamford replaces Steven Naismith.